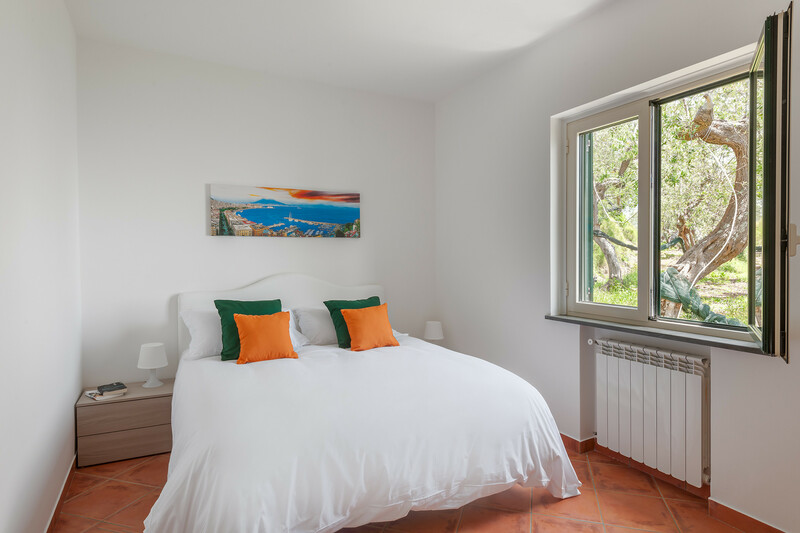 You will find Villa Saretta in a rural setting, right in the heart of the Sorrento Peninsula. 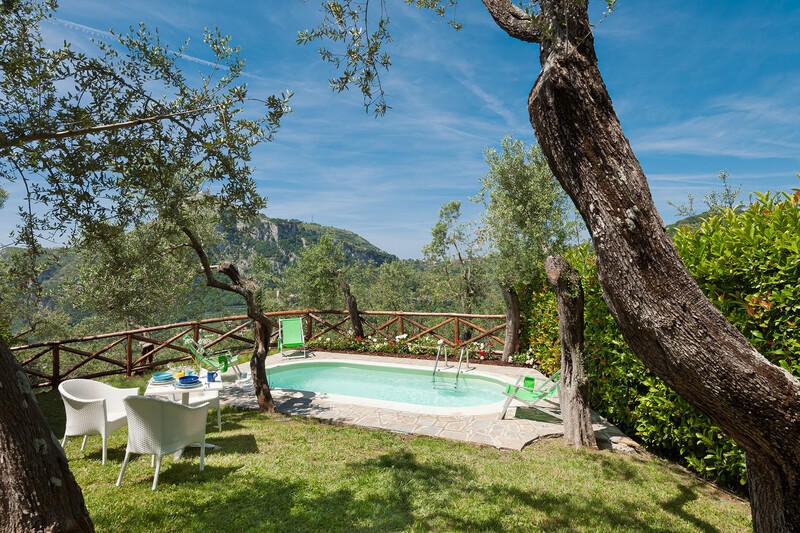 The villa is a perfect base for your holiday, whether you are looking for a peaceful bolthole in which to relax, or you wish to explore the attractive towns and beautiful countryside within easy reach of the property. The road that leads to Villa Saretta is steep and only partly asphalted. It is also rather narrow in places (minimum width 2m) and is therefore not suitable for larger vehicles such as people carriers. The benefit of this access lane is the peaceful location, undisturbed by traffic. 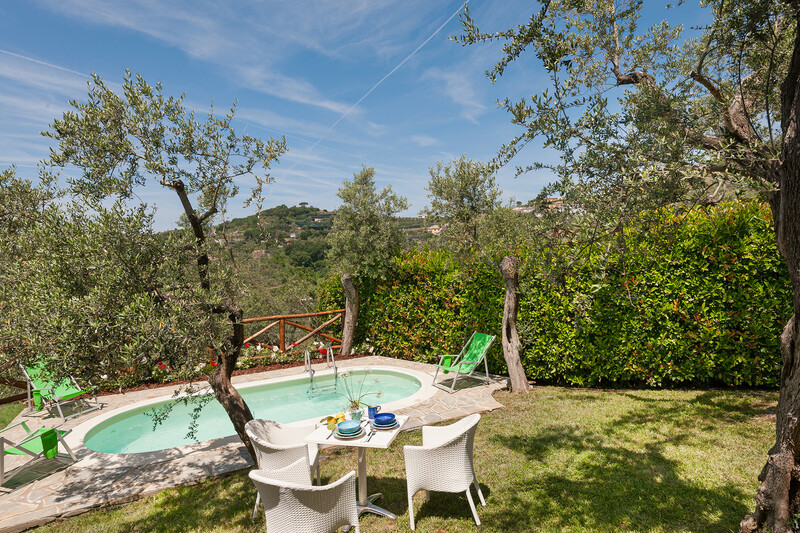 Villa Saretta is south facing, with the garden blessed with sunshine throughout the day. 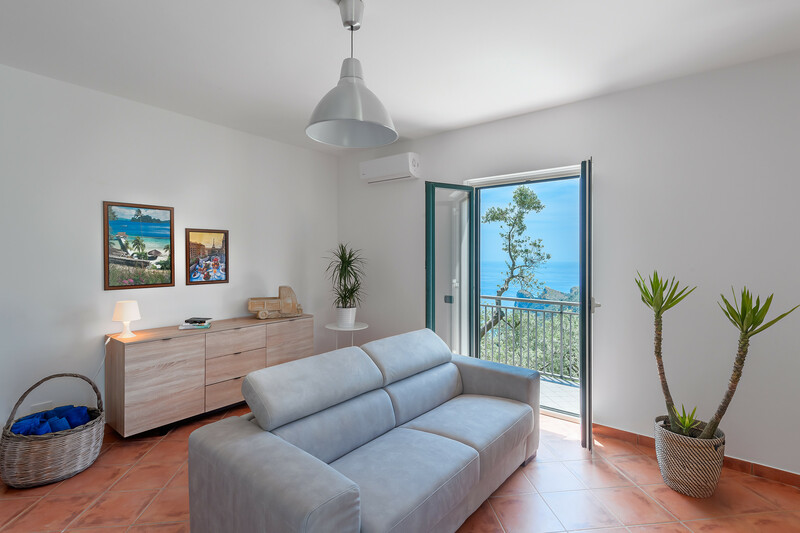 There are splendid 180° views of the landscape of the Sorrento Peninsula and the ocean beyond – a real treat for the eyes. Measuring 200m2, the garden is partly shaded by trees and features an above ground pool measuring 5.4m by 2.4m, with a depth of 1.2m. The pool is open from 1st April to 31th October. There is a barbeque, should you fancy a spot of al fresco dining, plus a dining table and chairs, and sun loungers on which to relax. Whether enjoying a morning cup of coffee or savouring a glass of wine as the sun goes down, you will find the perfect spot in which to unwind. 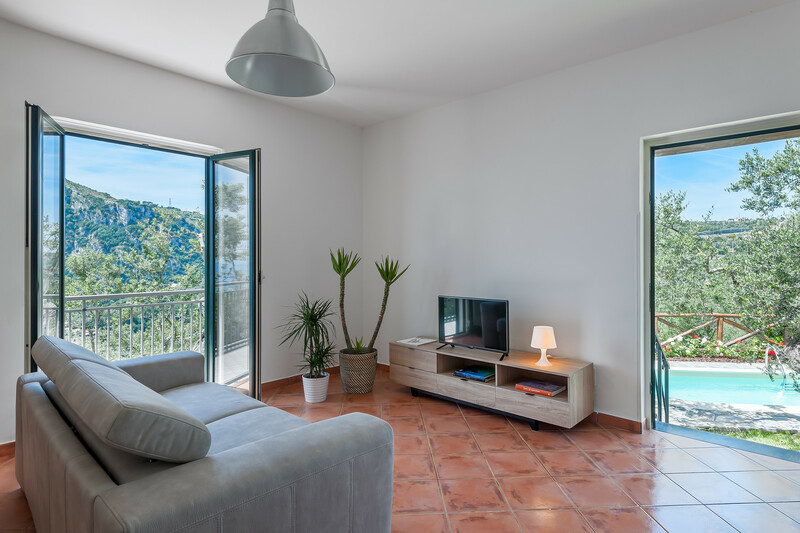 The single-storey villa measures around 100m2. The living room is cosily furnished with a double sofa bed, a dining table for six, an enclosed fireplace, a television and a CD player. There is an internet Wifi connection. Central heating is available for the chillier months of the year, chargeable at 4.50 Euro per m3. Doors lead from the living room onto the terrace from both sides, providing an airy, light feel. 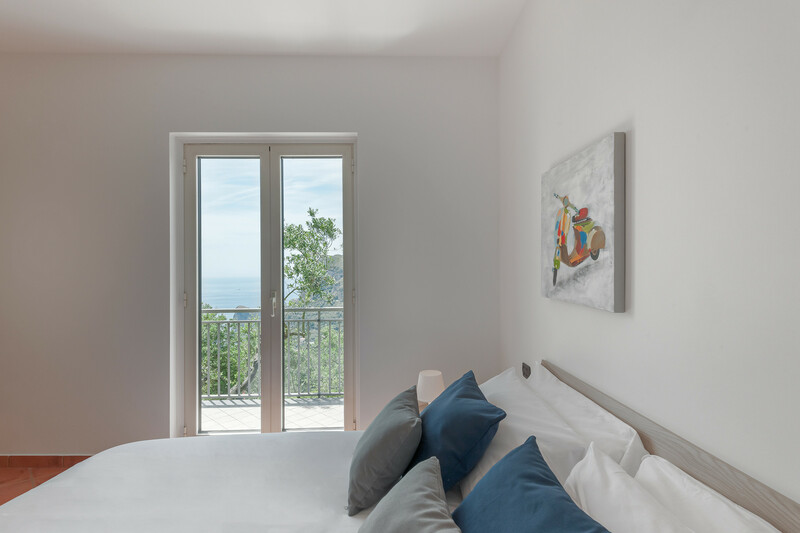 Stroll outside and soak up the wonderful views of the sea and the surrounding countryside. The large, modern kitchen has white units and a window onto the garden. 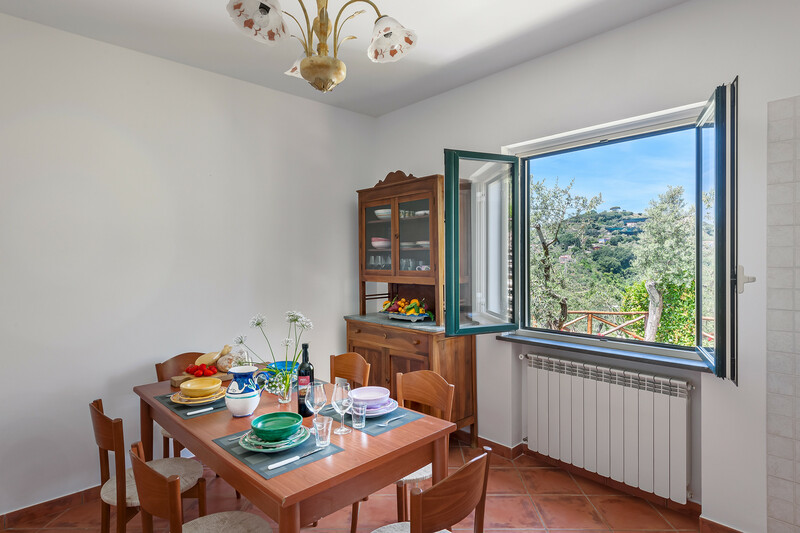 There is a dining table for six, plus everything else that you will require; including four gas rings, oven, fridge freezer, microwave, kettle, toaster and Italian coffee maker. There is also a washing machine, iron and ironing board. Walking along a short corridor, you reach the bedrooms. 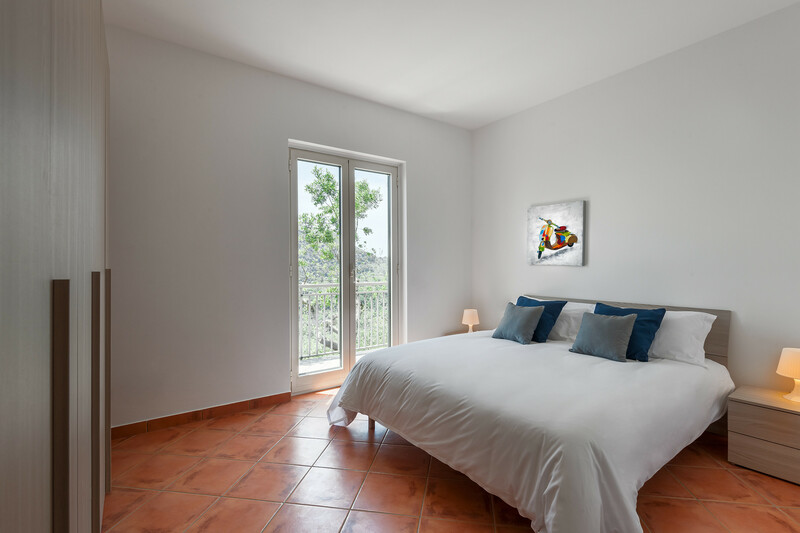 The double bedroom has simple and comfortable furnishings, plus plenty of storage space and a window that looks onto the terrace. The second bedroom has two single beds, a desk and a shuttered window that has garden views. The spacious bathroom is decorated in neutral tones, with glossy hand-crafted ceramic tiles, and has a bath, separate enclosed shower, wash basin, toilet, bidet and hairdryer. A car is recommended for your stay at Villa Saretta and we are happy to assist with arranging car hire if required. You will find a reserved parking space on arrival at the property. It is around 4km to the coast, where delightful beaches await you. 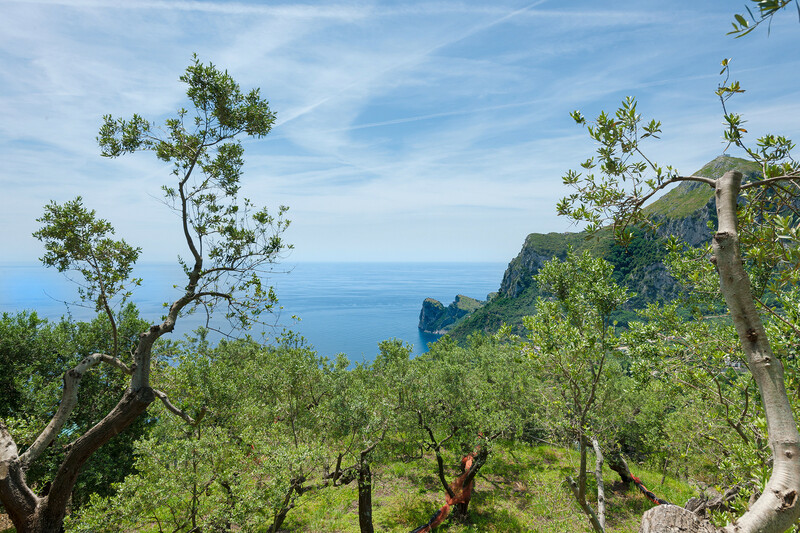 The town of Sant'Agata Sui Due Golfi is just 3km away, where you will find several family-run restaurants, gelaterias, fresh pasta shops, fruit and vegetable stores, mini-markets, bakeries, butchers and fishmongers, coffee bars and pubs. 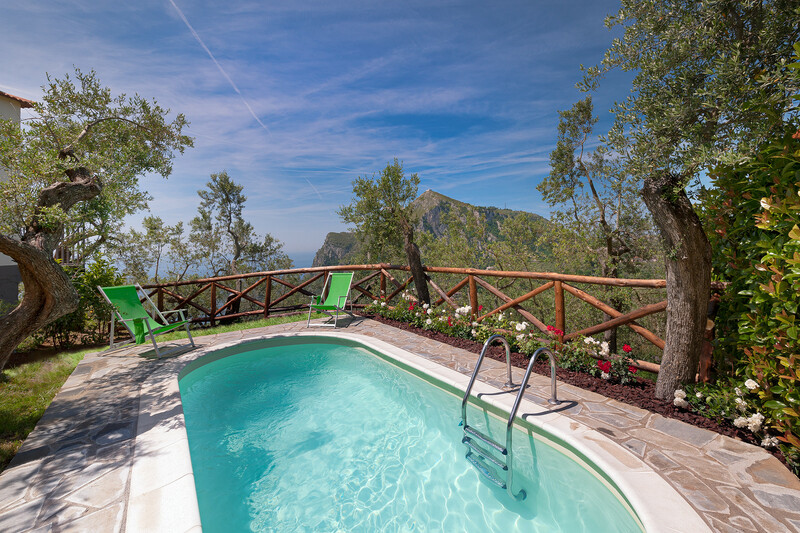 In comparison to Sorrento, Capri or Positano, prices in Sant’Agata are very reasonable. 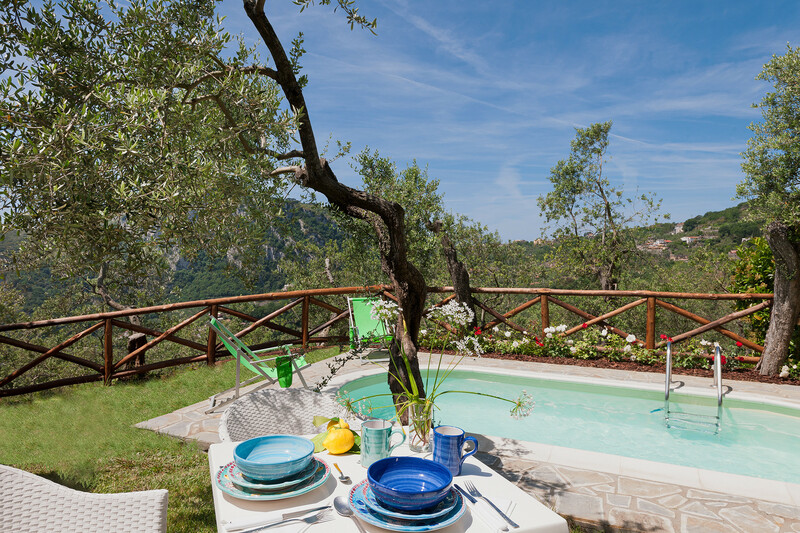 If you are looking for a peaceful break in the midst of the beautiful Sorrentine countryside, Villa Saretta offers the ideal accommodation. 2 Double beds, 2 Sofa beds double. 1 Bathroom with bathtub, Hair dryer. 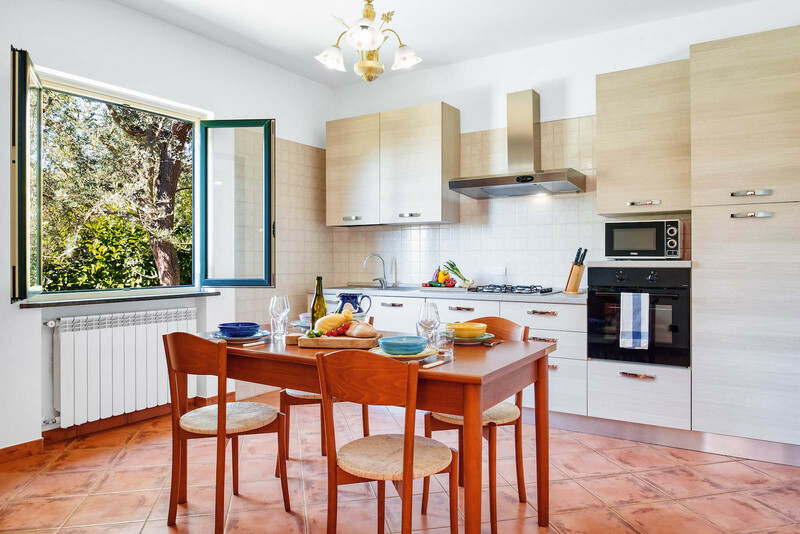 1 TV, garden, garden furniture, barbecue, iron, internet (Wi-Fi), hair dryer, balcony, 80 m² property, 180 m² plot, single boiler on gas, air-conditioned, private swimming pool, Open-air parking (2 places) in the same building. 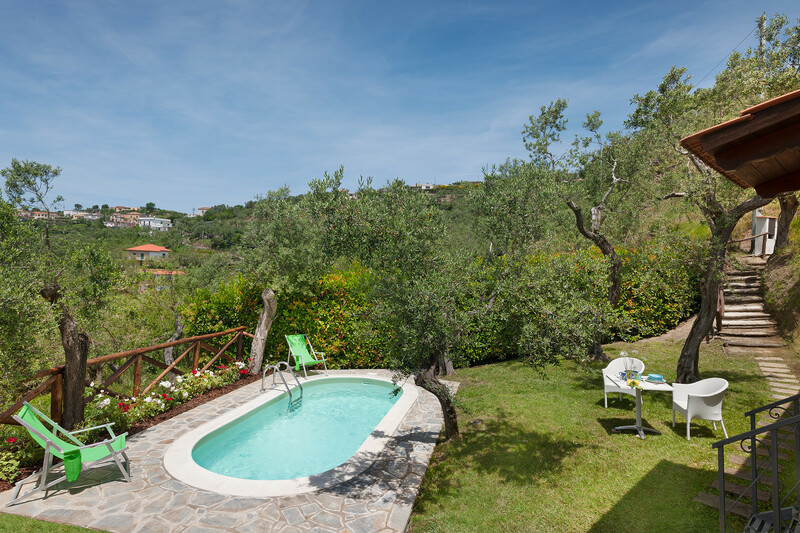 Very nice and cosy villa in a great and quiet environment. Ideal for a family stay. Prachtig uitzicht! Fijn huis, en fijne ontvangst. Goede service: er werd de zelfde dag nog een BBQ gebracht omdat de genen die daar stond te oud werd bevonden! Suggesties voor restaurants en strand werd gestuurd via de ab, Prima! De locatie is te bereiken via een zeer smalle weg. Wij hadden een Fiat 500 L gehuurd en met de spiegels naar binnen geklapt konden wij deze net bereiden. Nadat de auto geparkeerd was, moesten wij nog zo'n 100 meter lopen over een soort "landweggetje" door de olijven bomen (voor de avond kan je hier lichten aan doen) voordat we het huis bereikte. Als je van rust en privacy houd is dit zeker een aanrader. This is a great place to stay. I personally am very sensitive with hotel when i am traveling, but this place was outstanding with comfort and clean. One thing that might consider as downside is that, if you are traveling with public transportation with big luggages, it would be a bit hard to get here, but other wise this place is very clean, quite, spacious. Especially, in the morning, it is sooooo good place to have a cup of ocffee in the small garden. One more thing, if you are driving, it would be hard to go in road that leads to the house from main road is a bit narrowed. Sarretta was a superb place to stay.